The recent victories of the right-wing, anti-immigrant United Kingdom Independence Party says more about our scapegoats than about its long-term prospects. The success of the UKIP rests on nostalgia for a brutal past shrouded in mythology, as well as fear of a future buffeted by neoliberal globalization. The party’s electoral base comprises older, less-qualified blue-collar workers drawn primarily from the Conservatives. Farage, a former commodities trader and nationalist “libertarian” whose buffoonery has been mistaken for authenticity, appeals to many of those disaffected from politics and disillusioned with the political class. 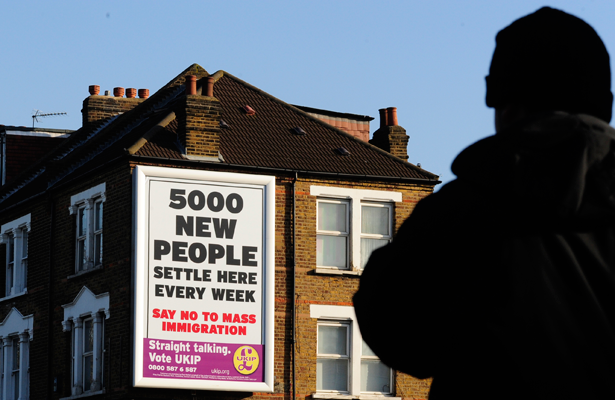 The UKIP’s particular blend of cultural atavism, political populism and economic nationalism may be unique to Britain. But its broad agenda is emblematic of a trend that spans everything from the Tea Party to the French National Front. Across the Western world, a sizable section of the white working and middle class is terrified. Their wages have stalled; their welfare is being slashed; their jobs are emigrating; labor, skilled and unskilled, is immigrating. A 2010 New York Times poll showed that more than half of self-described Tea Partiers were concerned that someone in their household would be out of a job in the next year, while more than two-thirds said the recession has been difficult or caused hardship and major life changes. In recent years, the most marked slump in support for foreign trade and the sharpest increase in anti-immigrant and anti-Muslim sentiment has been among Republicans in general and white people in particular. Their political classes have actively colluded in these developments. Both Labour and Conservatives, like most of Europe’s establishment parties, want to remain in the European Union. In the United States, it was the Democrats who introduced NAFTA and deregulated finance. Looking for alternatives, some have sought solidarity across racial and national boundaries to combat these increasingly enmeshed political and financial interests. In some places, like Greece with Syriza or France with the Left Front party, this has taken on an electoral expression, with varying degrees of success. That, among other things, was what the Occupy movement was all about: a global articulation of resistance to this crisis that identified the enemy as the powerful, not the powerless. The tragedy is that while these foot soldiers of the hard right correctly identify the illness, they seek a remedy that will only make them sicker. In this regard the UKIP is exemplary. The European Union is deeply undemocratic, and the austerity agenda of the European Central Bank is destroying almost every country where it is imposed. If a referendum were held tomorrow on whether Britain should be in the EU, most polls show it would be very close. That’s why there’s never been one. But as the man who blamed the banking collapse on government, not greed, and who branded the Occupy movement “fatuous, anti-enterprise left-wingery,” Farage would more likely be found cowering under his desk waiting for his bonus. Not only does he have no coherent strategy for changing the policies that have served his base so poorly; as a cheerleader for deregulation and free trade, he actually champions those policies, then channels the consequent desperation toward hyper-patriotism and bigotry. Midterm local elections in Britain are notoriously hard to read, and the UKIP has surged before, only to fade. But even if its popularity is fleeting in Britain, the phenomenon has deep roots worldwide: open doors for capital and closed minds for culture; free movement of machines, closed borders for people; classically liberal economics and classically illiberal politics. While the UKIP represents a sharp turn to the right for British politics, MP Jon Cruddas wants to radicalize the Labour Party, wrote D.D. Guttenplan in last week's Nation.